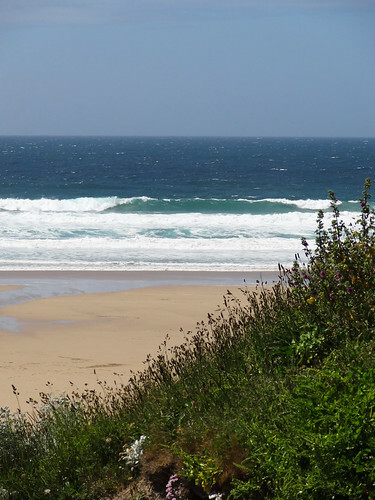 This was a really quiet little beach, just North of Newquay, at a place called Watergate Bay. Apparently Jamie Oliver's Fifteen Cornwall restaurant is on this beach, but I didn't see it until after we were leaving the car park. 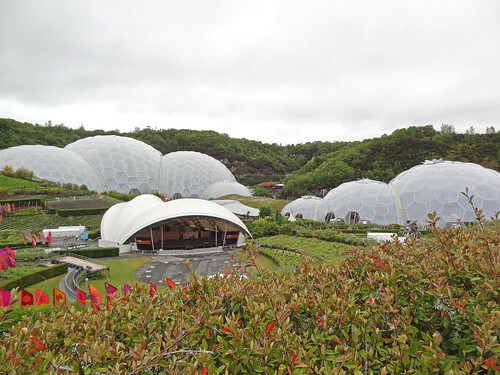 Of course, we went to the Eden Project. I love that place. I won't inflict any more holiday photos on you, but if you are interested, here is the link to the rest of the album. 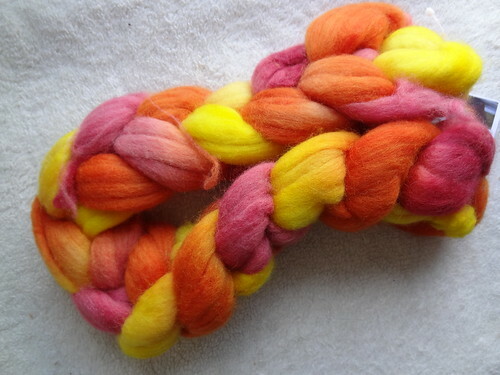 The fibre I have spun is from EasyKnits. It is Polwarth/De-Haired Camel blend in the Exterminate colourway. This colourway is a complete departure, for me, from my usual colours. I think this is part of what made the spinning so pleasurable. The other thing \I enjoyed was the fibre itself. It is such fluffy fibre. I really need to learn more about spinning terms so I can describe what I mean by "fluffy". As this fibre felt so plump I decided that I wasn't going to fight it's nature and try and spin a skinny lace weight yarn. I divided the fibre in two and then each of those sections into three, using a scale. I then spun each of the six sections into quite fat plies and then plied two sets of 3-ply yarn. After a good soak and a solid thwack, I have approximately 140m of fibre. I really wish I knew how to get an accurate measurement of the gauge of the fibre. I suspect it's an aran weight. I have heard about spinning apps that help you work out gauge. If anyone knows what one is called, I'd love to know. Here is the yarn I've ended up with. And a close up, so you can see the plump and fluffy plies. I am so pleased with this yarn. It's incredibly warm and soft. 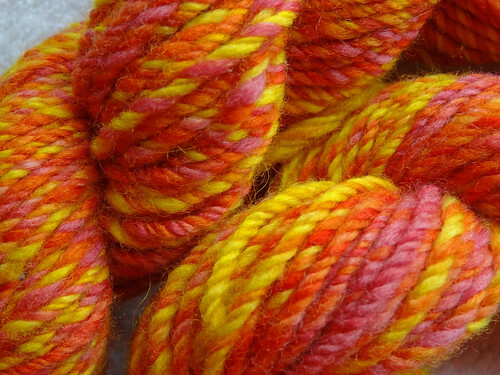 Initially I was going to use the yarn to make a Rebecca Danger monster, because of the bright and cheerful colours, but now I really want to make an accessory out of it. I think maybe a hat or a cowl. 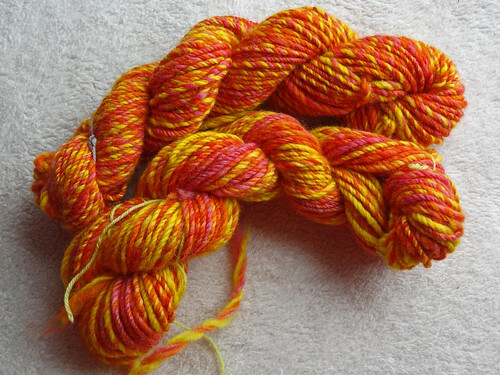 after enjoying this Polwarth so much, I bought some more fibre to spin. I ordered it from Countess Ablaze. 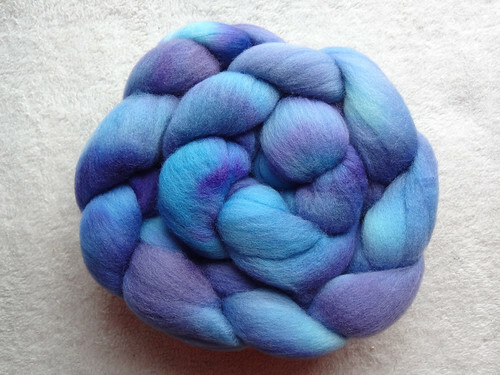 It is so pretty and as it is pure Polwarth I'll get more of an idea of what it is I liked so much about it. I don't know what to begin playing with next, from my growing fibre stash. It's a tough call, but I think I should choose something with different fibre content so I can keep on learning what I like to spin and why. I've subscribed to Spin-Off Magazine from Interweave Knits, so hopefully that will help me as I go forward in my spinning career. I may also invest in a copy of Fleece and Fiber Sourcebook to help understand a bit more. Hopefully my posts will become more informed over time!